The Vines are an Australian rock band formed in Sydney in 1994. Their sound has been described as a musical hybrid of 1960s garage rock and 1990s alternative rock. The band has been through several line-up changes, with vocalist/guitarist Craig Nicholls serving as the sole constant throughout the band's history. The Vines' success in the Australian recording industry resulted in winning an ARIA Award in 2002, 'Breakthrough Artist – Single', for "Get Free" and receiving five other nominations for their debut album Highly Evolved, plus two further nominations in subsequent years. In 2003, the album went platinum in Australia, and since then the band has released four albums and a best-of compilation from their time at Capitol Records. The Vines have released seven studio albums to date. 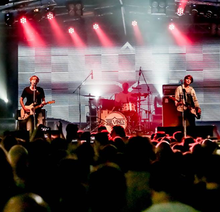 The original line-up of Rishikesh formed in Sydney in 1994 when vocalist and lead guitarist Craig Nicholls and bass guitarist Patrick Matthews met whilst working at their local McDonald's in the suburb of South Hurstville, New South Wales. They were soon joined by Matthews' school friend David Olliffe on drums. The name "Rishikesh", suggested by Olliffe, refers to the Indian city where the Beatles visited an ashram in 1968. The local newspapers regularly misprinted the name as "Rishi Chasms", so Nicholls suggested a new name, "the Vines", as an homage to his father, who fronted a local band called the Vynes. The group started performing Nirvana and You Am I covers at backyard parties while developing their sound on Nicholls' four-track recorder. Over the next few years, the Vines gigged infrequently and remained relatively unknown, even in their hometown, yet by the beginning of 2001 they had amassed a repertoire of over thirty songs. On the strength of their demo, Rex Records put out what was to be their first single, "Factory", as a limited seven-inch single. The release became NME's Single of the Week in November 2001. In July 2001, the band flew to Los Angeles to start recording their debut album, Highly Evolved, with Rob Schnapf. David Olliffe was replaced a few months later as a result of increasing record company interest, and the band had sessions with drummers such as Joey Waronker of R.E.M. Their debut single, "Factory" was released in November 2001 in the UK and gained a good response in the press, with the NME describing their garage rock sound as "of the oldest school". The band then signed to Heavenly Records in the UK in December 2001 and EMI in Australia in April 2002. The single "Highly Evolved" earned them more critical acclaim as NME made it a single of the week in March 2002. The single charted in the UK at number 32 on the singles chart and on Australia's ARIAnet top 100 singles chart. The band appeared on the cover of Rolling Stone in October 2002 (the first Australian band to do so since Men at Work in 1983) with the words "Rock is Back: Meet the Vines" boldly emblazoned underneath. Referred to as the 'The' bands, the Strokes, the Hives, the White Stripes, and the Vines combined "old fashioned punk and adrenaline fuelled riffs" to be ushered in at the beginning of 2002 as the "saviors of rock". The release of the album saw more critical success, with the band appearing on the cover of NME. The album reached number 11 in the U.S. Billboard Hot 100 albums chart. The band played high-profile slots on the Late Show with David Letterman and the MTV Video Music Awards. Several more singles were released from the album, including "Get Free" and "Outtathaway!". A fourth single, "Homesick", was released in Australia only. The band went on to win an ARIA Award, 'Breakthrough Artist – Single', for "Get Free" in 2002, and were nominated for "Best Group", "Best Rock Album", "Best Cover Art", and "Breakthrough Artist – Album". Highly Evolved sold 1.5 million copies throughout the world with distribution through Capitol Records. By end of 2003, the album went platinum in Australia. Craig Nicholls realised while touring for the promotion of their debut album, Highly Evolved (July 2002), that they needed an additional guitarist. So Nicholls asked his longtime friend and schoolmate Ryan Griffiths to join. "Get Free" from the Vines' debut album Highly Evolved. In May 2003, the band went into a studio in Woodstock, New York with Rob Schnapf again on production. While Craig Nicholls had talked of having a highly produced album, he told the Australian edition of Rolling Stone in March 2004 that they decided to stick to a less-is-more philosophy. "I wanted it to be – in my head – something grand, with big ideas and that vision sort of thing. But at the same time, that doesn't mean that something can't be special if it's just simple. Because I think that the songs are the main thing". Their second album, Winning Days, was released on 29 March 2004 and rose to number 23 in the US. "Ride" and "Winning Days" were released as singles in Australia (where they did not chart) and the UK. In mid-2005, the group announced they were working on their third album, with producer Wayne Connolly. Andy Kent of fellow Australian band You Am I filled in on bass playing duties. In November of that year, the band's management announced they had finished recording all the songs that would appear on the album. "Don't Listen to the Radio" was released as the album's first single, and was made available for digital download on 7 March on iTunes. The song was used on the soundtrack for the video game FlatOut 2. "Gross Out" was made available for digital download on 18 March, and was the first song leaked from the album. Vision Valley was released on 1 April 2006 in Australia, 3 April in Europe, and 4 April in the United States. Vision Valley consisted of short, immediate songs; the album running little over 30 minutes in length. "Anysound" was the second official single from the album, and an animated music video was released exclusively through YouTube. The song was included as a track heard on the in-game radio in the 2007 LucasArts published Thrillville: Off The Rails. "Dope Train" was released as a third single, with a music video composed of live footage of the band from Big Day Out in 2007. On 19 July 2006, the Vines played a gig at the Annandale Hotel under the name "Joe Dirt", with a new bassist, Brad Heald, after former bassist Patrick Matthews departed the group. In 2007, the Vines signed to Ivy League Records for an Australian album deal. The first single preceding the album Melodia was "He's a Rocker", which was released through iTunes on 3 June 2008 along with two bonus tracks. "MerryGoRound" was released as a follow-up single for radio airplay in Australia during August 2008. "MerryGoRound" only received support and backing from Triple J radio. "Get Out" was released as the third single from Melodia in September 2008 for radio airplay, and a music video was released to coincide with the release of "Get Out" as a single by Ivy League Records on YouTube. "Get Out" was featured on the in-game soundtrack of Midnight Club: Los Angeles released in late October 2008 on Xbox 360 and PlayStation 3 gaming platforms. In October 2008, the Vines commenced a national Australian tour in support of Melodia, playing small venues throughout Australia. In November 2008, the Vines were announced as being part of the line-up for the 2009 Australian Big Day Out, but the band cancelled. On 14 November 2009, the Vines played at the Annandale Hotel, under the alias of the Crimes. They had a support slot with You Am I, playing their back catalogue and a new song from an album due in 2011. The Vines recorded in early 2010. They also played gigs that year, including a set at the Annandale Hotel on 23 June where they debuted new songs "Future Primitive", "Gimme Love", and "Black Dragon". They also played Splendour in the Grass on 1 August and Singfest, a Singapore music festival on 5 August. At the start of September, they supported Powderfinger at the first four shows of their farewell tour. A music video for "Gimme Love" wrapped filming on 1 March 2011, with the completed video surfacing online through YouTube on 27 March. The music video pays homage to the 2010 film Scott Pilgrim vs. the World. It's cool that we're still together and that we got through it all, all the hard times and all the ups and downs. I know a lot of other bands have split, but I guess I just don't know what else I would do if I wasn't doing this. – Craig Nicholls May 2011. Over a year after its completion, Future Primitive received an official release date through The Daily Telegraph on 3 June 2011. Because the Vines did not have a label at the time of recording, the band members funded the album's recording themselves. Upon the album's completion, the band approached various record labels to see if any were interested in signing the band for its release, explaining the year-long delay between recording and release. In May 2011, the Vines played on-stage with the Dandy Warhols at the Enmore Theatre in Sydney for the song "It's a Fast-Driving Rave-Up with The Dandy Warhols". The two bands had previously had dinner at the Warhols' studio The Odditorium in 2004, along with the bands Jet and the Strokes. In an interview with Music Feeds at Splendour in the Grass 2011, Nicholls talked about a late 2011 or early 2012 release date for their still unnamed sixth album. On 26 November 2011, rumours on the band's Facebook page suggested that the band had "pushed out" two of its members. At the 2011 Homebake music festival, the Vines emerged on the main-stage as a three piece, consisting of Nicholls, Heald and drummer Murray Sheridan. The departure of both Griffiths and Rosser was confirmed by Channel V presenter Jane Gazzo, who wrote that the two had been "sacked" in a Twitter post. Craig's sister, Jess Nicholls, also confirmed their departure via the band's official forum. "If any of you were at Homebake yesterday, I'm sure you can agree the set was amazing and sounded better than ever," she wrote. "The band has made a creative decision to revert back to a three piece, as they originally started. I know you will probably have a lot of questions but just wanted to say don't fear, this is in no way the end of the Vines!!" Nicholls, Heald and Sheridan performed again at Southbound music festival in Perth on 8 January 2012. On 16 March 2012, Rosser announced that he had joined Australian rock band Wolfmother, as their new drummer, on the Faster Louder website. He also claimed that the band had "broken up," although "Craig [Nicholls] will always write great music in the future and he may choose to carry on under the Vines’ name." On 30 March 2012, the Vines' Facebook page changed its profile picture to a single previously unseen promotional photo of Nicholls, implying that he was the only remaining member of the band. Heald confirmed his departure from the band in 2012. A new line-up, consisting of Nicholls, drummer Lachlan West and bassist Tim John, entered the studio to record their sixth album on 20 August 2012 in Sydney's 301 Studio and completed the mixing of the album at the end of 2012. On 18 April 2013, the band's management, Parker & Mr French, announced via their Tumblr page that "the new record from the Vines is definitely on the way". Additionally, "2013 has the Vines sixth album in the incubator and an announcement coming about a new and the first collaborative side project from Craig Nicholls." was written on the band's own section of the Parker & Mr French Tumblr page. West revealed in a June 2013 interview with his other band, Something With Numbers, that two producers have worked on the forthcoming Vines release. Paul McKercher produced the first half of the record and Lachlan Mitchell, who also produced the latest Something With Numbers record, worked on the second half based upon West's recommendation to Nicholls. The article also stated that the new Vines album was "due for release in the latter half of this year (2013)". However, the year passed with no new material from the band or news as to when the album would be released. On 3 June 2014, a new press shot featuring the new line-up was uploaded to the band's official Facebook page, as well as a new cover photo containing an updated version of the band's original logo. According to a June 2014 Faster Louder article, in addition to the anticipated sixth album, a seventh album was recorded with the new line-up. At the beginning of July 2014, the Vines created a PledgeMusic page for their sixth record Wicked Nature, a double album which was released on 2 September 2014. The lead single "Metal Zone" was released on July 14. Its music video premiered on Noisy on July 11. In spring of 2015, it was announced that Craig Nicholls started a side project called White Shadows, which focused on electronic music. A debut album for the project, titled Secret Of Life, was later released that year. Its lead single, "Give Up Give Out Give In", was released on April 9, 2015 with a music video produced. The album featured over 70 different guest musicians. On 25 March 2016, the band changed their profile picture on Facebook to the band's logo. Along with this came a new post featuring a picture of Craig Nicholls in the studio playing guitar with the caption "Album #7 coming soon..." On 1 April 2016, the first single "In Miracle Land" was released. In October 2016, the band played three shows in Australia for the 'In Miracle Land' Tour in support of the upcoming album of the same name. During the tour, the band debuted new songs "Hate the Sound", "I Wanna Go Down", "Broken Heart", "Sky Gazer" and "Gone Wander". The title track has yet to be performed live. In June 2017, it was announced that Highly Evolved was to be reissued on vinyl to coincide with its 15th anniversary. In May 2018, The Vines' official Facebook page announced that The Vines would be joining Jet as the opener for the two Sydney dates of their Get Born anniversary tour. With the announcement came the news that the shows would be with the line-up of Nicholls, Matthews, Griffiths and Rosser. The shows marked Matthews' first with The Vines in 14 years, and the first in seven years for Griffiths and Rosser. On 31 May 2018, it was announced via Facebook that the album In Miracle Land would be released 29 June 2018. It features the same line-up as Wicked Nature. Unlike many other pop post-modernists, the Vines never sound weighed down by all the influences they include in their music—it's as if they're so excited by everything they hear, they can't help but recombine it in unique ways. Ex-bassist Matthews believed that Winning Days was a step in a different direction for the band. "The themes are more introspective and less wild rock'n'roll". Their music also was described by Chart Attack as having "neo-psychedelic arrangements". Upon the release of their debut album, the Vines were hailed as "the second coming of Nirvana" by the British press; their grungy sound was considered reminiscent of the Seattle scene circa 1991 and Nicholls' erratic on-stage behaviour and raw vocals drew comparisons between him and Kurt Cobain. Highly Evolved became a huge success and their accompanying live shows in the early years were praised as "electrifying" and "sensational". Critical reactions to 2004's Winning Days were mixed. Pitchfork's Chris Ott described it as being "nothing more than boring and harmlessly vapid" and showing "only mild promise". Conversely, Rolling Stone' David Fricke said it was "a leap forward in style and frenzy". In 2006, the Vines created a decorated heart card to benefit PETA. In 2007, the group joined the organisation in calling for an end to Canada's seal hunt. ^ a b "The Vines – Guest Program". abc.net.au. 5 October 2002. Archived from the original on 23 May 2008. Retrieved 6 December 2014. ^ a b "The Vines – Guests and Specials – Rage – ABC Television". abc.net.au. 30 July 2011. Retrieved 6 December 2014. ^ "NME 2001 lists". Rocklist.net. Archived from the original on 27 March 2008. Retrieved 6 December 2014. ^ Robinson, John (30 October 2001). "The Vines : Factory". NME. Retrieved 2 October 2011. ^ "2002 NME Single of the Week Chart". NME. Archived from the original on 25 March 2008. Retrieved 2 October 2011. ^ Sheffield, Rob (6 August 2002). "The Vines". Craig Nicholls has all the makings of a rock star. Rolling Stone. Archived from the original on 29 October 2007. Retrieved 13 April 2008. ^ Schlauch, Jeff (13 February 2003). "Retro rock rules airwaves". Bands like The Hives and The Strokes are proclaimed rock saviors. The Equinox. Archived from the original on 3 January 2009. Retrieved 13 April 2008. ^ a b "The Vines Song Chart History". Billboard. Prometheus Global Media. Retrieved 6 March 2013. ^ a b "The Vines Awards". Allmusic. Rovi Corporation. Retrieved 6 March 2013. ^ "Vines in a tangle". Sydney Morning Herald. 5 June 2004. Retrieved 2 October 2011. ^ a b "Whither the Vines?". The Age. Melbourne. 22 May 2004. Retrieved 2 October 2011. ^ "Winning Days". Rolling Stone (Australian Edition). March 2004. ^ "'FlatOut 2' (PS2/Xbox/PC) Rockin' Soundtrack Revealed". worthplaying.com. 31 May 2006. Retrieved 24 June 2015. ^ "The Vines stage a comeback". fasterlouder.net.au. 16 November 2009. Archived from the original on 4 April 2012. Retrieved 2 October 2011. ^ "FUTURE PRIMITIVE". thevines.com. 2011. Archived from the original on 25 October 2012. Retrieved 17 August 2012. ^ "The Dandy Warhols + The Vines – It's a Fast Driving Rave-Up". YouTube. 30 May 2011. Retrieved 2 October 2011. ^ Sean Gothman (16 April 2004). "DIG! SF". dandywarhols.com. Retrieved 2 October 2011. ^ Brayden Darke (3 August 2011). "The Vines New Album – Late This Year or Early Next Year Release?". musicfeeds.com.au. Retrieved 2 October 2011. ^ "New members? – Page 2". Thevines.forumotion.com. Retrieved 10 April 2012. ^ "Vines drummer joins Wolfmother; claims The Vines have "broken up"". Fasterlouder.com.au. 16 March 2012. Archived from the original on 19 April 2012. Retrieved 10 April 2012. ^ "Profile Pictures". Facebook. Retrieved 2012-09-17. ^ a b "The Vines prepare for comeback, have two albums recorded". Faster Louder. Faster Louder Pty Ltd. 5 June 2014. Archived from the original on 8 June 2014. Retrieved 8 June 2014. ^ "Lachlan West Webstagram". Lachlan West. Archived from the original on 14 July 2014. Retrieved 25 November 2012. ^ "Parker & Mr French Tumblr". Parker & Mr French. Archived from the original on 4 January 2016. Retrieved 20 April 2013. ^ "Parker & Mr French Tumblr - The Vines". Parker & Mr French. Archived from the original on 4 January 2016. Retrieved 20 April 2013. ^ "Counting In the New". Michael Smith. 15 June 2013. Retrieved 18 June 2013. ^ "The Vines Official Facebook". The Vines. 3 June 2014. Retrieved 8 June 2014. ^ "The Vines: Wicked Nature". PledgeMusic. 2 July 2014. Retrieved 7 July 2014. ^ "The Vines announce new double album". NME. 2 July 2014. Retrieved 7 July 2014. ^ Ross, Annabel. "The Birth of White Shadows". rollingstoneaus.com. Rolling Stones. Archived from the original on 18 May 2015. Retrieved 12 May 2015. ^ "Original The Vines Line-up Reunite To Join Jet's Australian Tour". theMusic.com.au. The Music. Retrieved 13 May 2018. ^ Phares, Heather. "Highly Evolved – The Vines : Songs, Reviews, Credits, Awards : AllMusic". Allmusic. Retrieved 16 July 2012. ^ Keene, Darrin (21 May 2002). "LIVE: The Vines". chartattack.com. Archived from the original on 29 April 2003. Retrieved 16 July 2012. ^ James Oldham (26 March 2002). "Vines: Highly Evolved". NME. Retrieved 14 May 2014. ^ Mike Usinger (15 April 2004). "Vines Show Growth". straight.com. Retrieved 2 October 2011. ^ "Fruit of The Vines". The Sun-Herald. 30 July 2002. ^ "NME Reviews - Vines : Brighton Freebutt". Nme.Com. 2005-09-12. Retrieved 2015-11-02. ^ Ott, Chris (14 April 2004). "The Vines: Winning Days". Pitchfork. Archived from the original on 1 February 2013. Retrieved 16 July 2012. ^ "Get Valentine's Day cards from The Vines and Franz!". nme.com. 9 February 2006. Retrieved 16 July 2012. ^ "Jet and the Vines Join PETA Against Seal Slaughter - Starpulse.com". starpulse.com. 15 May 2007. Retrieved 16 July 2012. "Don't Listen to the Radio"